Saw this on Instagram today, I am not sure I will be getting a Transit anytime soon or spending $40k to convert it, but pretty cool to see products like this being developed. Or just buy a 2020 Transit AWD ! The Vancompass system is far more capable looking. 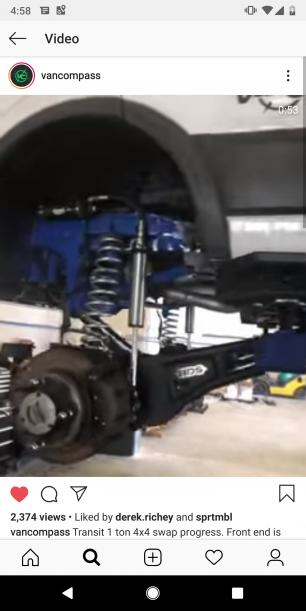 Solid axle and beefy link arms. Does anyone know if the 4x4 Transit will have a 2 speed transfer case? I love that they are doing that, but are there really that many people who are going to shell out that kind of cash for the kit? I know people go to UJoint for $20k kits all the time, but even Ujoint is only doing 40 kits a year and many of the parts exist already. I do like that they powdercoat all their proprietary parts blue so you can see what they have added Vs. what was there before. Agreed, the stock AWD will not be nearly as capable Off-road, as something like this. It likely won't have a true Low Range or 2 speed transfer case is my guess since its an AWD and not 4x4, but will probably have a pretty low 1st gear with the 10 speed transmission or whatever it is getting. I think a true 4x4 conversion would still be ideal for me personally if I were in the market, the AWD will be great for snow though. I think the Transit is pretty ugly really, and is worse the higher the top gets. Very very unlikely. AWD not 4x4 and not heavy duty. It's shocking to me how much more attractive I find the sprinter to be. But I would never buy one. The transit is ugly, but will be my next purchase. I agree. Just another average so so AWD drivetrain I bet. Great for snow, not for getting far off road. I had a Transit and couldn't agree more. I look at them every day and at some angles I shield my eyes. Other times they look ok. Bigger wheels and tires help a LOT. I want to love Sprinters but I fear them.